This painting is one of the largest in the Stirling Views exhibition, currently on show in the Stirling Smith. The artist is M. Fleming Struthers, a Stirling artist closely associated with Joseph Denovan Adam’s School of Animal Art at Craigmill. Struthers was a prolific artist, who exhibited regularly in the Smith and in other local exhibitions. Very little is known about him, and this is currently the only work of his in a public collection. 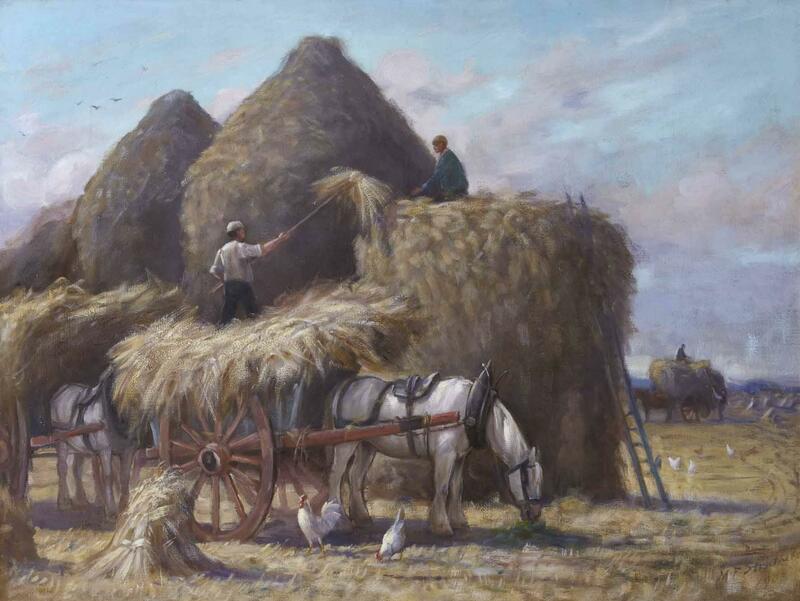 The painting celebrates the glory of a Stirling hay harvest and the construction of hay ricks which were such a feature of the landscape in the twentieth century. The Drummond Agricultural Museum in King Street, led the way in the nineteenth century, demonstrating new methods of building hay ricks, for the drying of the crop. Timothy hay in the mid twentieth century was a major crop in the Stirling area. The Timothy Seed Association was set up to maintain standards, and to regulate and inspect the crop. It was prized as feed for race horses, and Carse of Stirling hay was in high demand at Newmarket and other English race courses.